I know if a regular piece of clothing is well made, but that's about the extent of my knowledge in this area. Perhaps you could do a series of posts explaining the various levels of luxury? Though this wasn't asked of me, as so often happens in the blogworld, I began to think, Are there various levels of luxury? I'm not addressing consumption at this level today; that's a matter of individual choice and means that I'll discuss in Part Two. I'd sort luxury clothing or accessories (products of fine quality, workmanship and design) into four categories, with some overlap. My brand examples may not resonate for you, and some brands have drifted up and down. Though some brands borrow features of luxury, they are not generally thought of as luxury; merchants call this niche "class for mass". The materials may be natural fibers but are often blends, the workmanship decent, the brand recognizable and desirable (at least to its target market). Sometimes the brand ramps up its image by introducing limited edition or designer-affiliated pieces, like Uniqlo and J. Crew do. The logo is often apparent. Clothes are not usually lined. You may see copies of higher-priced styles. The brand may be attributed to a person, but she is rarely the actual designer. There is some overlap with Level 2, which is exactly what the makers want. Even at this level, when quality drops, customers are bitter. Here you find natural fibers, good finishing, more generous hems, better quality buttons. (Though not as good as in the past. I say sternly, where are the pearl buttons?) You'll see embellishment and detail (feathers, beading, trim) but also well-cut minimalist clothes of fabrics like double-faced wool. 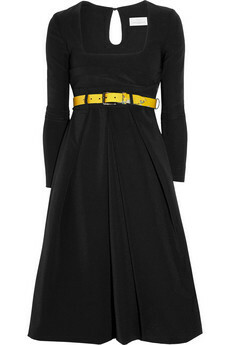 This $1,625 Preen black dress should look and feel different from the $340 J. Crew black dress at Level 1 and nothing like a $75 one from Target. There's a wide range of prices at this level, from things you can buy in a top-tier department store (e.g., MaxMara) to items sold only in boutiques. The logo is nearly always apparent on shoes and accessories, and sometimes on clothes, and the designer actually designs at least some of the line. Ready-to-wear of fine tailoring; details may include hand-finishing, high-quality embellishment like leather trim on a sleeve-edge; full linings, bound buttonholes. At this level the fabric should be excellent. You will also find more fragile fabrics, such as gossamer-weight silks and laces. Brands in this category must work hard to balance exclusivity with growth. The houses cycle through designers, who may be relatively anonymous, or stars. There may be a couture collection (Level 4) and sometimes a second, lower-priced label intended to scoop the Level 2 customer, as well as fragrance and sometimes make-up or accessories. Logos go low-key but there are exceptions like Vuitton, which would probably go dark if they discontinued the monogrammed bags. These goods do not depend on brand recognition, and offer the highest standards of workmanship and quality. They cater to clients who do not wish the ostentation of brands, or who want bespoke. Prada was once one, before Miuccia Prada achieved worldwide saturation. The goods can be bought only at one or a few small company-owned boutiques. Examples: Tailors and couturiers; specialty crafts like tiny Japanese denim boutiques and Italian leather-goods makers; exquisite, sometimes unmarked ateliers in world-class cities or exclusive resort locales. There may be a small, subtle cipher in an inconspicuous place, but no big logos. A woman wearing a couture Alaia suit will recognize another woman in one, but we might not. We would, though, notice the perfect fit and impeccable line. Most of the recognized houses are now global brands kept afloat by perfumes and ready-to-wear (Dior, Chanel, YSL.) While prices are astronomical, there is a good resale market for the best examples from renowned designers. That's the landscape of luxury, a destination I have visited on occasion, but where I don't live. Is it desirable? Is it worth the very high price? I'll tackle that on Thursday, Part Two: Can You Live with It? But right now I'm wondering, do you pine for luxe? Does luxury attract, repel, or incite some other emotion in you? I love how you have broken down fashion. Once one has known Level 3 or 4 (even if just one garment) it proves difficult to get excited about Level 1. Level 1 reminds my of my early attempts at sewing (which I abandoned in favour of knitting).My dear father in law had an expression "you cannot make a silk purse out of a sow's ear". When the material is not pleasing, how can the end result be? Your question was: Do I pine for luxe? The simple answer is no. While the clothing is beautiful and quite luxurious, I find it to be something that would not add to the quality of my life. I have noticed that most any decently made clothing, shoes, handbags, etc are quite expensive for the average person. I post on an internet board where the subject of shoes came up and most of the women there prefer to pay little more than $25.00 for a pair of shoes. (I wear Stuart Weitzman which I consider good quality.) Reading what others can afford for shoes gave me some pause and makes me realize that the truly luxurious brands that you writes about in this post are truly for the top end of the 1%. helen tilston: I actually find Level 1 fine for me, *if* I can find the best pieces, but some Level 1 is riding on reputation, with poor fabric or finishing. One has to really inspect the garments. Susan: Luxury-level goods are sometimes available through secondhand stores or markets like church bazaars and eBay, at prices that can approach regular goods. I know women of limited means who are geniuses at finding Level 2 and Level 3 things in such places, and have scored a few finds myself- but one has to put in the time. Level 4 is definitely a rarified market. Am skeptical the durability of $25 shoes. As one friend's mother used to say, "We are too poor to buy cheap clothes." Great breakdown. I tend to pine more for the level 3 accessories than clothing (Bottega Veneta bags are gorgeous, but now horrendously overpriced). But with clothing, I need practicality, so I tend to stick with the Crews, Fishers, and an occasional Lafayette 148 (which at retail prices probably is in your #1 category). Susan, I'm also a fan of Stuart Weitzman shoes. Yes, they are pricey but I have a few pair that I've worn for 6-7 years. They hold up and don't go out of style. I agree with the idea of "we are too poor to buy cheap shoes"---totally agree. But, I dare not say that to those who buy them. I'm committed to the quality level of Stuart Weitzman and my La Canadienne boots for myself. They seem to be sufficient. I do shop at a consignment shop that has level two and three clothing. Usually it is a bit long in the tooth before it arrives. It just doesn't appeal to me as a "must have" item. I think a woman has to really be into fashion to lust after the truly luxurious. It's enough for me to stop in front of the Oscar de la Renta window at our local mall and admire. I love Weitzman shoes, they feel great on and wear forever. I am in the entry level apparel area with the exception of the occasional Hermes silk square and my beloved accessories. Where have all the pearl buttons gone? I love the luxe look that they add to cashmere sweaters. Oddly, the cheapest garment is the only one I could actually see myself wearing, though I would certainly recognize the fine workmanship and materials in the higher-end ones. The shoddy workmanship and cheap-looking materials (yes, the buttons) on midrange garments nowadays is galling (yes, I know that is a geezerish observation). I couldn't possibly afford any but the first, but on the other hand I don't recall ever buying $25 shoes, except perhaps decades ago when $25 was worth a lot more. I need good leather shoes, ideally with leather linings as well (arthritis) and try to find reasonably pretty or at least funky ones. I highly doubt most of Susan's board group women are buying $25 shoes because they are too destitute to buy something decent. Like Gretchen, I love looking at such luxe items, and visiting museums of fashion, art and design. I don't know WHY they are buying $25 shoes. I was shocked to read that such shoes could be purchased. I think they were buying them at Walmart, Marshall's etc and possibly on sale at that. I was taken aback and fully realize that you get what you pay for. I'm sure I'm a level one buyer also. To me, my Lafayette 148 items are plenty expensive, mostly nice quality, but certainly not the best. I can't imagine spending more for clothing. I don't lust for luxe, though I want to get the best quality I can afford and get multiple seasons out of my clothes. I'm squarely at Level 1, and even there, I'm happiest when I can buy an Eileen Fisher dress, for example, on sale rather than at full price. I don't go for status accessories, either. My preference is for ethnic or artisan silver jewelry and scarves, and bags that are interesting, real leather, and not covered with logos. As for shoes, I can't buy the cheapies anymore -- they make my feet hurt. (I type this wearing a much-loved, much-worn pair of Geox ballet flats. I reckon the cost-per-wear is down to pennies by now!) Fortunately for me, I can buy shoes and bags made in the EU out of real leather, for not a ton of money. As I have aged, I'm wearing level 2 clothes and level 3 accessories. I believe older people should wear nicer clothes. Thanks for this explanation. Very informative. I'm definitely Level 1. I admire luxe but, no, do not pine for it. It's amazing. You can look at it, study it and create your own version with carefully chosen pieces. With impeccable grooming and a killer haircut I believe you can pull off a look that looks luxe. And you know the saying: It's not what you wear; it's how you wear it! Love your break out of the various levels. I would really love to be able to shop even at level 1 for some clothing, but I have to budget for Walmart/Target/Kohls for everyday clothes. So-I put my discretionary $$ into shoes-I spend anywhere from 100-250 for a pair-I have bad feet and I then wear them for years; I have one pair that is 13 years old now and doing fine after resoling. I only buy about one pair every year or two. I recently bought my first nice bag (Saddleback tote at 1/2 price) in over 20 years (my 1981 Coach finally bit the dust). The only way I have found to have well made clothing from nice fabric is to make it myself (I can tailor), or to luck out in a consignment store and alter if necessary. I can do this for a few nice pieces, but have to make do with 'OK' items for everyday wear. The hard part is that I know what quality looks and feels like. This is an interesting way to sort things out, Duchesse. I'm glad you mentioned that very fine quality items can occasionally be found among the level one offerings, where they gleam like jewels in base metal. I have a few of those in my closet: a platinum charmeuse Ann Taylor shell with the simplest scarf tie, a pair of department- store cashmere shirts with pearl buttons (white on the beige one, abalone on the black,)an artfully cut and lined cotton Calvin Klein Sport sundress. All of these I will wear until they wear out; each cost less than $100. It's so important to look past labels to those indicators of quality you have described. By pairing low-cost standouts with once-expensive thrift shop finds, it really is possible to enjoy some luxe without going broke. To your question, "Does luxury attract, repel, or incite some other emotion in you?" I say, YES! I love the way you've broken this down. And I found the others' comments very interesting. I don't crave luxe for luxe's sake, but I dislike many man-made fibres. I've recently taken up sewing for myself again, since I love the feel of a silk blouse but can't find exactly what I'd like in the stores. And if I wear wool, it has to be lined. But when I purchase, it's at Level One or lower. I'm glad you took on this topic. It's true that fabric quality is the big tip off--or it should be. I was in San Francisco a few years ago and saw a woman standing outside her waterfront property. She was wearing simple camel separates but I could see the fabric was of exquisite quality. I could barely keep myself from touching her arm. On the same trip, I was at the deYoung Museum, where I saw a youngish woman wearing a Chanel jacket and a Birkin bag with her cutoffs. Honestly, the jacket wasn't all that impressive (except that I knew what it was) and as for the Birkin--it was as though the woman was wearing money on her arm. I often test myself at thrift stores and I am fooled more and more often--for whatever that is worth. Gretchen: The "except for" puts you into a different category than "just looking". One one has inhabited a beautifully-fitted piece, the body seems to remember what it feels like. pseu: Could that be because accessories might last longer? (My BV bag lives far more in in its flannel storage bag than out!) Somehow I can justify luxury in a wallet or bag more than in a dress that I worry will date or I will "outgrow". hostess: I order pearl buttons from various internet vendors and replace many plastic ones with them. lagatta: That could be because the higher one climbs the more the clothes are made for and shown on runway-type bodies. though some couture clients are curvy (like Sophia Loren) you will hardly ever see them presented that way. You could indeed wear the Alia suit, if it were made for you. Anonymous @ 3:06: Thanks or commenting, it is good to hear from someone doing that. sanda: To an extent. A J. Crew dress does not look like a Balenciaga dress no mater how well-accessorized and groomed a woman is, but women like to think so. I held my tongue when someone posted her Target LBD saying "I wore this in Paris and I looked so chic". She looked like a pretty woman in a $75 dress. Nothing wrong with that but it is what it is. You can lift a lower cost item only so far, and if you are in a room full of women in couture suits you will note the difference pretty fast. Trish: I would put the serious money into shoes and bag, too. And maybe learn to sew, as Lorrie (see belew) has. C.: It's deeply satisfying to find an item that hits above its weight. I like that most of all! The piece must fit perfectly. I am impressed with a current J. Crew hacking jacket with working sleeve buttons, too. Lorrie: Sewing is one way to get it, if one has the skills and patience. Those "easy sew" patterns do not deliver much unless your body loves rectangles. 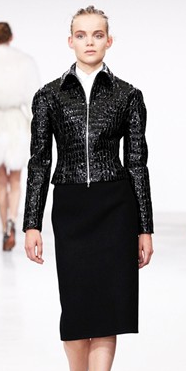 I have a friend who can make exact Chanel suit copies, including handsewn details. She did it professionally for years, for elderly ladies who wanted the quality at one-fifth the price. Frugal: Luxury items can be badly worn, and money does not confer taste. I often visit clothes I can't afford (and which do not fit my life) to continue to appreciate beautiful fabric and workmanship. I go up and down your range, and right now am very happy with the mix. Never used to wear J. Crew, now that I'm working, find myself shopping there a lot. Love my Tory Burch dress and Etoile Isabel Marant jackets, but they aren't the same thing as my Chanel jacket or Prada dress. I couldn't imagine wearing nothing but the high end stuff, it takes up too much of my brain when I have it on. To say nothing of the cost, of course. I am very very appreciative of this post. I suspect I am aspiring to level 3 for reasons I don't clearly understand...and I wonder if I haunt a consignment shop or two if I might have some luck. LPC: "Takes up too much of my brain when I have it on": would love to hear more, perhaps as your own post? Terri: Susan commented that consignment stores in her area the clothes tend to be dated, but where I live/have lived I was surprised by how many women evidently turn their wardrobes over annually. Some stores have better stock than others, and of course there is eBay, too. I really don't pine for luxe, although I can admire its beauty and craftsmanship. I have too many pairs of shoes in the $200-300 range that I'm still wearing 7-10 years after purchase to believe that one needs to go to Levels 2,3,or 4 for quality (although design, yes, is another matter). As well, there's a commitment to care, particularly dry-cleaning, that comes with that Level of Luxe -- which, frankly, seems the opposite of luxury to me. I do love beautiful fabric, though, and understand enough from sewing and knitting my own garments to have no quibble about prices . . . I just don't aspire to pay them, this lifetime at any rate. It is as much about lifestyle as desire. Even if I had the funds for level 4 I don't think it would fit into my current day to day life. Having worked in fashion for many years I still love and appreciate quality especially in shoes and bags. My current strategy tends to be classics in the sales if I can find them. materfamilias: I've seen you rock some solid 2s, based on what you have posted, and you look fab in a designer dress or skirt, among your other pieces. This post is downright brilliant on every level. To answer your question, I don't really pine for anything (except a best seller [ahem]).. . However, that being said, I think in a perfect world I would love to clear out my closet and start all over with Level 3 plus some special off the radar finds and have totally maybe 30 or 40 pieces of clothing. I sort of yearn to start afresh for some reason. Obviously budget constraints will keep this desire in the "what if" fantasy mode. After, I would carefully attack accessories and probably keep many I own today. Couture is divine, perfection, but can you imagine owning an evening gown for example that costs about as much as a four year college education at an Ivy League school? Can't quite get my head around it. Tish: I believe one can start over but maybe not at a level that requires major spending all at once. I did this, more or less, when I no longer had to enter a corporate office setting. If you suddenly do not need the same clothes any more, it happens naturally. But I kept the Hermes silk-print shirts. Thanks for a very interesting post. As someone who sews many of my clothes, I 'm not sure where i fit on this scale. Some characteristics that you mention I include as a matter of course - lined jackets and skirts, natural fabrics (Italian cottons, for example), buttons as fine as I can find. bound buttonholes on occasion. But I'm no designer and certainly don't fool myself that I can sew at a couturier level! My real advantage, I believe, is that I can fit the garments to myself rather than buying an imperfectly-fitting piece. Also, like many commenters, I tend to spend more on shoes, jewelry (mostly gifts from DH), and accessories. oh my, im level 3 everything!!!! I do not pine anymore for the luxe I had in my past. Now I try to keep it simple, because I'm cruising my bike, and washable. Sometimes a fine dress, but my daily uniform is a good fitting bottom and a cashmere sweater and, except Chucks, only comfortable (Arche, Think! )patent leather shoes and boots.For I am a fabric snob i buy less but the best quality I can afford. Guilty of pining here! I tend to have a variety of these levels in my closet, and I admit that I love the fabrics, detail and construction that identify the best of level 3 and 4. But I don't think I pine for it anymore. That doesn't mean that certain pieces don't appeal, or that I will never buy another luxury piece even though at the moment I am happy with a few pieces I have found lately, which I would say are level 1. There are many level 1 pieces that I could never accept however and will readily admit I am spoiled by expectation. When we moved I eliminated many level 3's that no longer fit my lifestyle but those pieces I wear frequently remain. I do know how to sew, and would like to begin sewing again. I have a weakness for luxurious fabrics, and my skills, although not up to level 4, and probably not even level 3 until I get back in practice, are enough that with good fabric I can make nicer things than I can afford to buy so I don't mind investing in nice quality fabrics, shoes and accessories. Once I start sewing, and regain skills, I will probably buy less, or better, but we will see. I don't have problems with the prices of luxurious clothes as I have a good sense of what goes into them, and they aren't necessary to my life, but I don't suppose I'm ready to shut that switch off completely. I think many women, who have no experience of true quality really don't appreciate the difference. They know someone looks "better" but they can't quite put their finger on it, whereas to those who know the difference, it is obvious. Or at least that has been my experience among women I know. Delurking and thanking you for your wonderful post, both in the ideas and the prose. 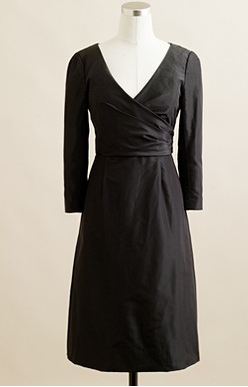 I still have a few pieces of clothing from a distant past that qualify as luxury, such as bespoke tweed suit, cashmere coat by Norman Norell, riding boots, and an LBD with lace inserts (which I hope to wear on my 50th anniversary this June!). But country life doesn't require more than good basics with very good fit and best quality I can afford. I don't miss my past, but I love to remember it. Thanks for such an intelligent and thoughtful piece of writing. SewingLIbrarian: Jewelry can lift even basics, and sewing for yourself has always impressed me. fran fillcombe: how is that working for you? Luxury can delight or not. barbara: I am where you are now, minus the bike. Have loved Arche for decades. Swissy: Thanks for de-lurking. Those pieces from our pasts will remain a fond memory. Happy 50th in advance and I hope you wear your dress! My luxe is in my fabulous scarves - one of which you gave me and I wear it frequently. Some of them are level 3, most level 2 or even -1. I have a Max Mara jacket I bought in 1985 which I wore for ten years then wandered into the same store looking for another. The manager looked shocked when he recognized the jacket and admired how it had aged well. It is a bit too retro to wear now, but I can't part with it. It is the most elegant shade of purplish grey, dolman sleeves and stripes on the front. So unusual,yet understated. I long for the need to wear luxe. diverchic: Maybe you can do a guest post on "luxury in the country"? Duchesse, I love this post but need more time to think about it before I can thoughtfully respond. Like Mardel, we love great fabrics but it will take time to build sewing skills. Martin is way ahead of me :).